Solutions for Small Business provides you with a discussion on the challenges that may face your business and how they may be overcome through the bankruptcy process. 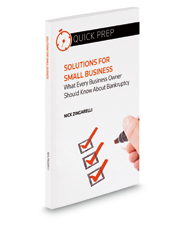 This book, authored by an attorney who has served as counsel to countless individuals, families, and small businesses over the years, can give you a better understanding of your business and how bankruptcy can help it. Business concepts such as cash flow, fixed and variable expenses, and business trends are discussed. In addition, tools are provided to help you evaluate some of the concerns that may be facing your business, including profit and loss, marketing, and tax issues. This guide includes insights on how the various types of bankruptcy can be utilized to assist with these same issues to possibly save or wind down your business, including modification of secured debts, addressing tax liability, and reduction or elimination of unsecured debts. This title gives you a greater understanding of the concepts that arise in bankruptcy so that you will be more informed when you meet with your bankruptcy attorney. This book is written in conversational, plain English rather than legalese and should be a valuable resource to new and experienced business owners alike.